Abstract: Socket 423 users have little options open to them for getting more 'horse power' under their hood. People who jumped on the Pentium 4 bandwagon early got stuck using the Socket 423 form factor and probably have a CPU that is sub 1.5 GHz. Socket 423 users have little options open to them for getting more 'horse power' under their hood. With an obsolete formfactor socket 423 owners have virtually been left out in the cold with no where to go. Even though moving from 1.5GHz to the Pentium 4 1.7 GHz it's not much of an upgrade in terms of raw MHz, this is a decent performing chip and is the best value CPU of the Socket 423 based P4's. For just under $300 CDN you can pick up a Pentium 4 1.7 GHz CPU, and considering that the 1.8 GHz version is $70 CDN more, the performance difference is negligible. 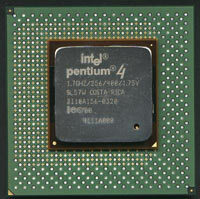 As we all know, with the introduction of the Pentium 4 Intel has done many radical things with the core. Most notably is the pipeline extension. 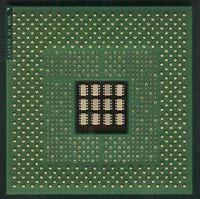 The P4 has a 20 stage pipeline which is double what the Pentium 3 had. This was done because with a 20 stage pipeline, clock speed could be pushed much further. However, the penalty for this is that far less work is done per clock cycle. In a sense, they've sacrificed work for clock speed. While generally we don't believe in lowering the workload of a CPU to get more raw MHz, the P4 has matured quite well. As you can see, the Socket 423 Pentium 4 is huge. Covering the P4 die is a large heat spreader which protects the core from damage and is a great idea even though in general Intel doesn't have the same problem as AMD does with their weak cores. It's nice to see a company take the extra step in protecting their products. Another handy feature the P4 has built into the core is a Thermal throttling feature. When it was first discovered, there was quite an uproar, however after the dust settled and people came to their senses everyone pretty much agreed that it's a good feature. After all, if the CPU is overheating, why not slow it down so it doesn't burn out? Since all Socket 423 Pentium 4's are based on the Williamette core, we weren't too enthusiastic about the overclockability of the CPU and we were pretty much on the ball here. We were only able to garner a 187 MHz overclock out of the chip which brought the total speed of the CPU to 1.89 GHz. Not the best overclock, but then again it's free so we shouldn't complain. The chip was manufactured in Costa Rica and the S-Code is SL57W. It looks like the P4 1.7 GHz can hold it's own in the Internet Content portion of SysMark2001 pretty well, those scores are about what I would expect however Office productivity is just horrible. Even when the processor is overclocked, the performance isn't that great. The P4 doesn't fair too well here in these benchmarks then again none of the software used in either Winstone's take advantage of SSE2 which would really boost performance if code was written for it.